The Sun Ray glider being tested in Woronora Dam in Sydney. These are the first images of the experimental Sun Ray military undersea surveillance glider, a $3.17 million defence project which looks as though it has come straight out of a James Bond movie. Shaped like a stingray, the prototype was built in a western Sydney suburb and has just undergone trials in Woronora Dam. It could be the forerunner of technology to be used one day in anti-submarine warfare or to monitor vessels illegally entering Australian waters. The link to the movie industry is actually quite real. The designer of the Sun Ray is Ron Allum who also built the Deepsea Challenger underwater vehicle for US film director James Cameron. The director then piloted it to the bottom of the Mariana Trench, the deepest place in the ocean, in 2012. Allum was also a member of Cameron’s historic Titanic expedition team in 2001. Underwater inventor Ron Allum with the Sun Ray glider. The glider contains an internal buoyancy vessel that can be flooded or pumped out to change the vehicle's displacement, making it sink or rise. The resulting movement of water over the wing's surface generates forward thrust, removing the need for propeller or water-jet propulsion. 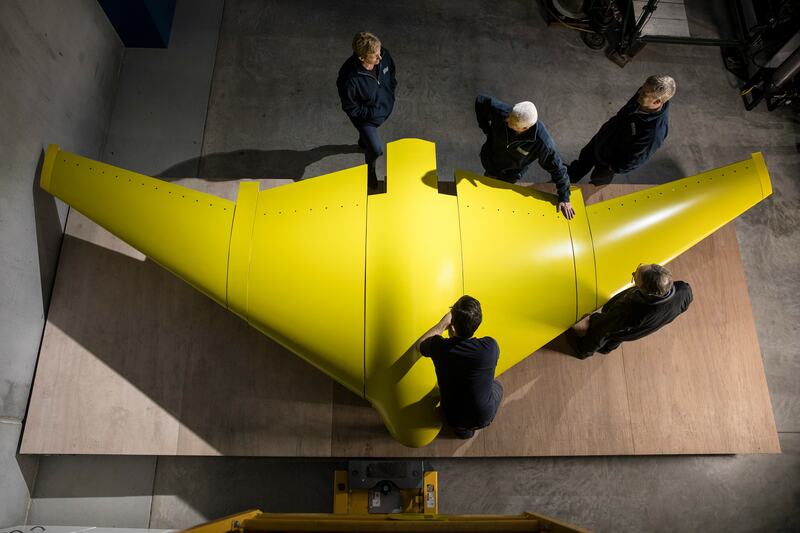 It is built partly of the same lightweight composite foam as the Deepsea Challenger and holds its shape even at extreme pressures, giving the glider greater depth capability than manned submarines. It may allow missions of up to three months, gliding more than 2000 nautical miles. The Defence Science and Technology group says to meet future requirements for "military undersea surveillance", a new breed of autonomous equipment is required. "High performance 'cross country' underwater gliders show great promise as mobile acoustic surveillance platforms," it states. Mr Allum said the oil and gas industry had also shown interest in the high tech structural foam but it was defence that had shown most enthusiasm. "Defence came to us and said could we build something that could go deeper and faster and we said yes. The Sun Ray can also carry a payload that is of interest to scientists and we are now looking at getting other contracts," he said. "Gliders are very quiet and that is certainly the advantage of this vehicle. It does use the motors for a few minutes when it could be detected but then the noise stops and it can be deadly quiet." Likely uses for the glider which is funded by the Defence Innovation Hub, could include the monitoring of marine life, mapping the sea bed and taking temperature measurements for climate change research. But it could also come into its own in the event of the loss of an aircraft, Mr Allum said. "The glider may not be the ideal vehicle to find MH370 but if you had a fleet of these gliders in the ocean, then if something like that happened you would be able to pinpoint that plane straight away. It would be like having satellites in the sky," Mr Allum said. David Liebing, Research Leader at the Defence and Science Technology group was slightly more circumspect about the way gliders could be utilised in the future. "It's about putting sensors on it that will give us information about what's happening under the ocean," he said. "What we are trying to do is, basically, take measurements under the ocean of everything from the temperature, the oceanography to measuring the ambient noise in the ocean and to knowing, for example, what marine life is around. "We are exploring concepts, we are trying to make them fly underwater correctly. What we are concentrating on is the technology. "It's a sensor that is out there, that can have long endurance, that we can measure the physical properties of what's happening under the water. It's no different to any other manned platform we have out there with sonar on it." Asked if the glider could be used to detect submarines, he said: "This project is not specifically about that and that is a long bow to draw at this time. It can listen under the water. At this stage we are looking at sensing the undersea environment and seeing what defence can make of that. "People dream about unmanned combat aircraft, we are nowhere near that sort of stage in the undersea environment. A manned submarine comes with intelligence, this doesn't come with intelligence yet. That's a huge step."